SERVICES. WE ARE DEALERS AND DISTRIBUTORS FOR THE MAJOR MANUFACTURERS, INCLUDING GRINDMASTER, FROSTY FACTORY, BUNN ULTRA, CECILWARE AND FABY / CAB. OUR NEW SALE PRICES ARE ALWAYS THE CHEAPEST TO BE FOUND. WE PROVIDE SHORT OR LONG TERM LEASES TO THE ENTIRE REGION INCLUDING HOUSTON, GALVESTON, CONROE TO COLLEGE STATION. FABY / CAB AND SANI SERV. 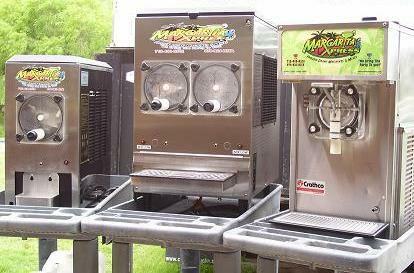 has specialized in Margarita Machines - Frozen Drink Machines and Slush Machines for over 10 years. Frozen drink machine sales, rentals, leases and repairs is all we do. We specialize in professional customer service and low prices. provides warranty and security, while saving money by purchasing a used or pre-owned machine. Our new margarita machine sales program allows the best pricing. We keep our overhead low, and pass the savings along to our customers. Margarita Xpress Margarita Mixes are some of the best available, for a cheap affordable price. Margarita Xpress does not sell, distrubute or provide any type of alcohol or alcoholic mixes or drinks. The use of our equipment in a safe and responsible manner is the responsibility of the customer. protect against driving while under the influence of alcohol. Margarita Xpress will charge an additional fee of 3.5% surcharge on purchase amounts charged to a credit card. OUR RENTAL MACHINES ARE THE BEST QUALITY! WE ONLY USE HEAVY DUTY / COMMERCIAL GRADE MARGARITA MACHINES! and you will always be treated with a friendly and helping frozen drink specialist. Our machines are new and are cleaned and maintained after every use. We only use heavy duty commercial Margarita and Frozen Drink Machines that will freeze in the hot Houston Texas heat. Our margarita mix is no doubt the best available. We have fine tuned the flavor to make our Margarita mix a hit at every party and event. You can only get our special blend from Margarita Xpress. Slush Machine or Frozen Drink Machine? How much liquor does the customer have to buy? Other flavors vary depending on your flavor choice........just ask us. Does the customer have to clean the Margarita Machine? No way, that's our job.....all you do is enjoy it! How long does it take for the margarita mix to freeze from startup? 45 minutes to and hour from room temp. Do you set up the Margarita Machine and show us how to use it? Yes, set up and instructions before we leave. How many drinks will 4 gallons serve? 70 - 75 of the cups we provide - which are 8-9 oz styrofoam. When do you pick up the Margarita Machine? Usually the next day, unless other arrangements are made. How soon must I cancel a reservation if something comes up? You must cancel with 24 hours of your party time or you will still be charged full price. This gives us a chance to rent the machine to someone else, and keeps us from making a trip for nothing. Parrot Ice, Sani Serv, and others. ALL TYPES OF FROZEN DRINK AND MARGARITA MACHINES. We have great prices and great service! 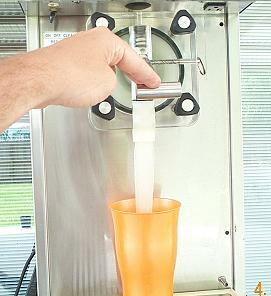 we make renting a MARGARITA MACHINE easy!